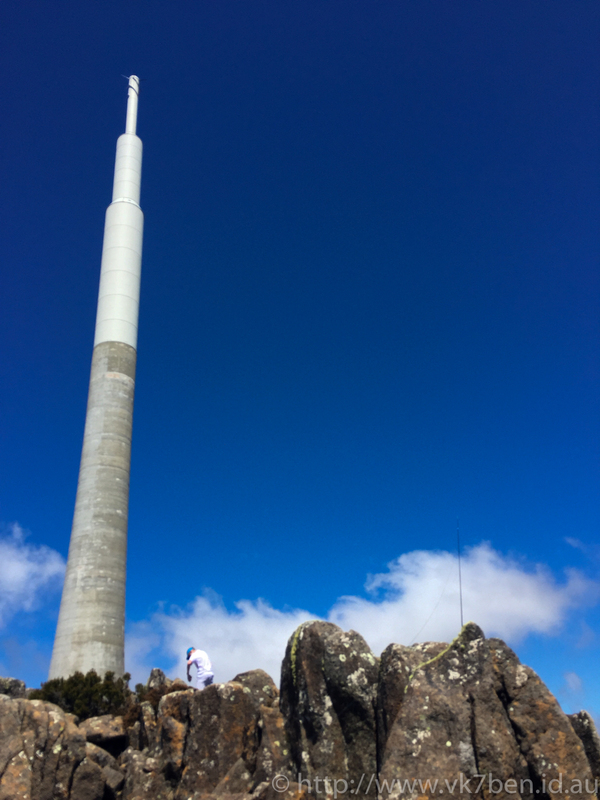 I really was not expected the number of people that we passed or saw on Mount Wellington. I have never seen it so busy with the car parks full, people everywhere and people walking up and down the roads between the summit and the chalet, a few kilometres down the road. The number of people taking photos around the summit made it simply impossible to set up there, so instead set up on a nearby rocky outcrop that was still within the SOTA elevation rules. 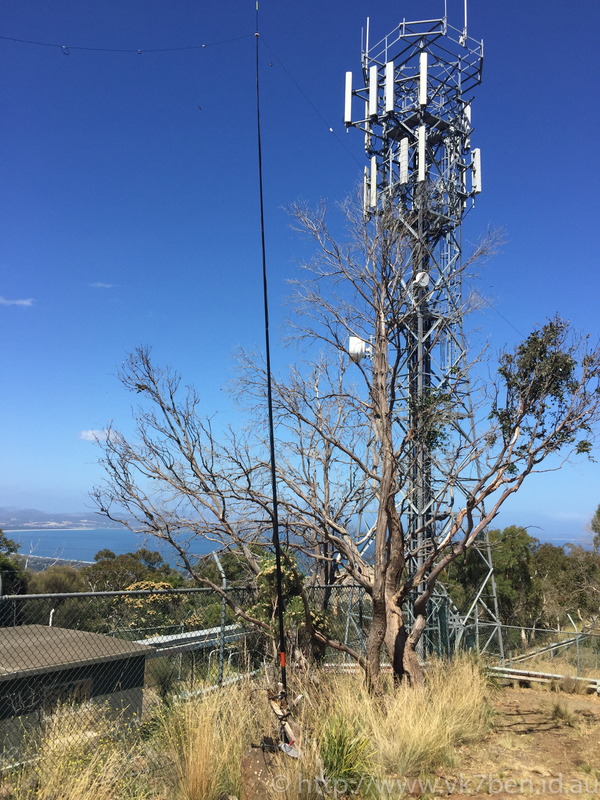 the location led to the end fed antenna being the choice of operations, having found some angle iron hidden in the outcrop to erect the squid pole with. The broadcast tower dwarfed my setup! The activation started off around 0300 UTC with a sneaky contact with Graham, VK3GRK on 7.090 with a summit-to-summit contact. Following Graham was Tony VK3CTM, Angela VK7FAMP and Rod VK7FRJG, making this summit my first activation. Richard very quickly was put into work as the logger for the activation. The activation itself was somewhat hampered by a faulty coax feed line to the end fed match box. Given the difficulties it caused I will probably purchase a professionally made cable assembly before using the patch lead again. One of the things I definitely was not expecting to deal with were mosquitoes and flies in almost plague proportions the moment you were no longer in the open. This along with the hot Tassie sun led to the activation being called off after half an hour. Following a successful activation of Mt Wellington, Richard and I drove to Mount Rumney, located on the Eastern Shore of the Derwent River in the city of Clarence. This is an easy to get to SOTA summit, but is also the location for telecommunications towers. This time, we set up the linked dipole in the hopes that I would have a smaller and more workable antenna footprint, along with a known working feed line. Unfortunately it wasn’t to be, with significant S7+ noise across most of 40m and no one around on the higher frequencies, save for VK3FNQS who we could hear, but they could not hear me. VK3BNJ started to make a contact with us, but disappeared when I returned his call. With it being pretty clear that we were not going to hear much on 40m, we packed up and headed home. Congratulations on the activation. I wasn’t around for the best part of the day today, and when I was I only heard a handful of the activators. Band conditions were quite poor. Well done on Mount Wellington. Your post brought back a lot of memories of climbing the mountain a long time ago (1960 to 1962). Your first SOTA activation will always remain with you: it is a milestone and there are plenty more summits in VK7 to go!